She’s a princess: dreamy, gracious, creative, kindhearted, resilient, strong, brave, funny, independent, free-spirited, and silly. Her imagination runs wild. She can be transported anywhere on this great big beautiful planet or beyond the stars above, in a heartbeat. Creativity is in her veins and I can only imagine the lens through which she views life. 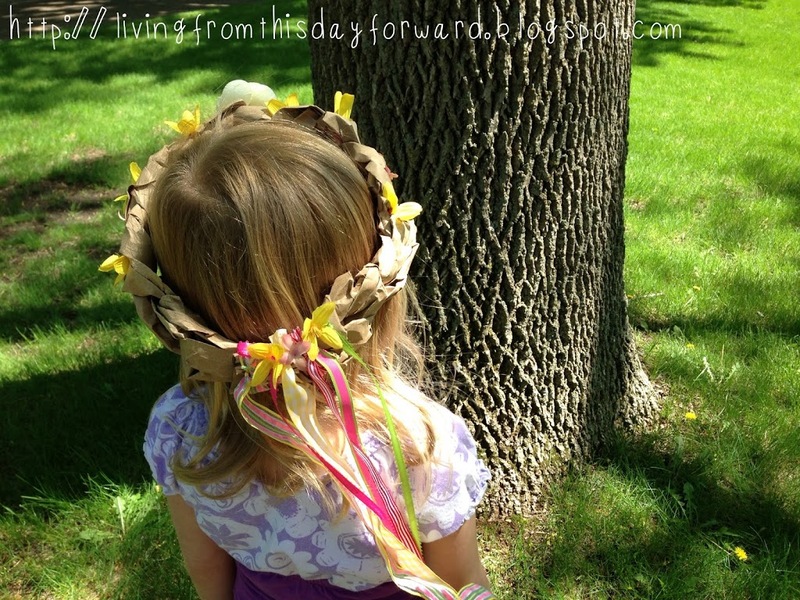 On this particular day she was a princess… a Woodland Princess. A Woodland Princess is resourceful and responsible. She makes good with what she has and takes care of her surroundings. Having great respect for nature she spreads beauty around her freely. 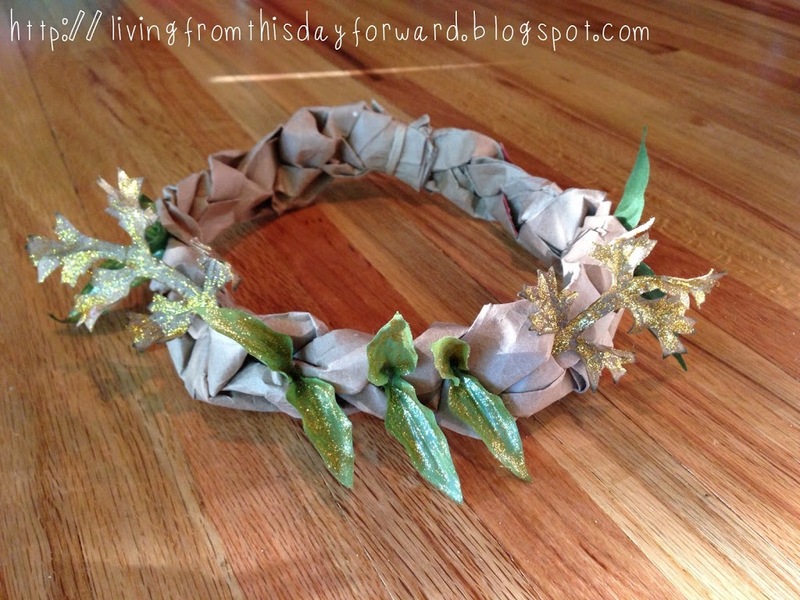 I was looking for a flexible paper material, like raffia or twisted cord, to replicate sticks or vines for a crown when it occurred to me that I could make my own. 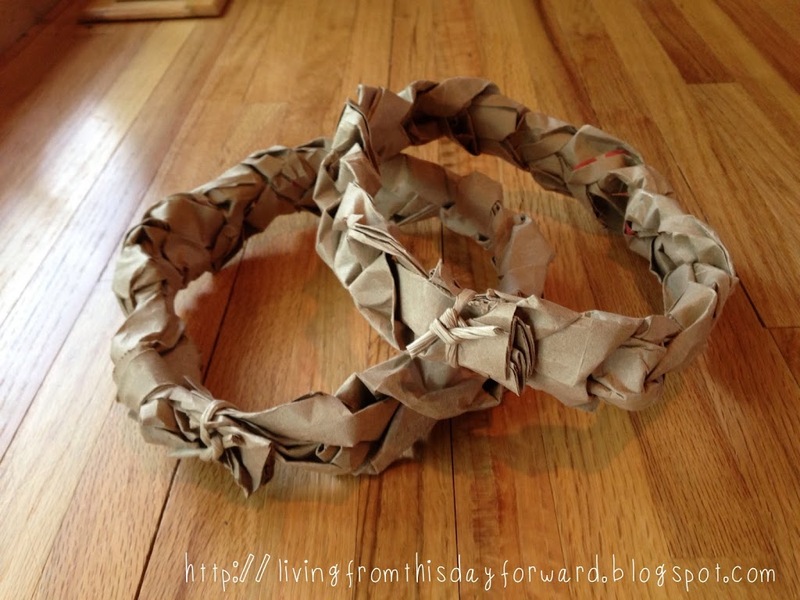 I found paper grocery bags to work wonderfully. 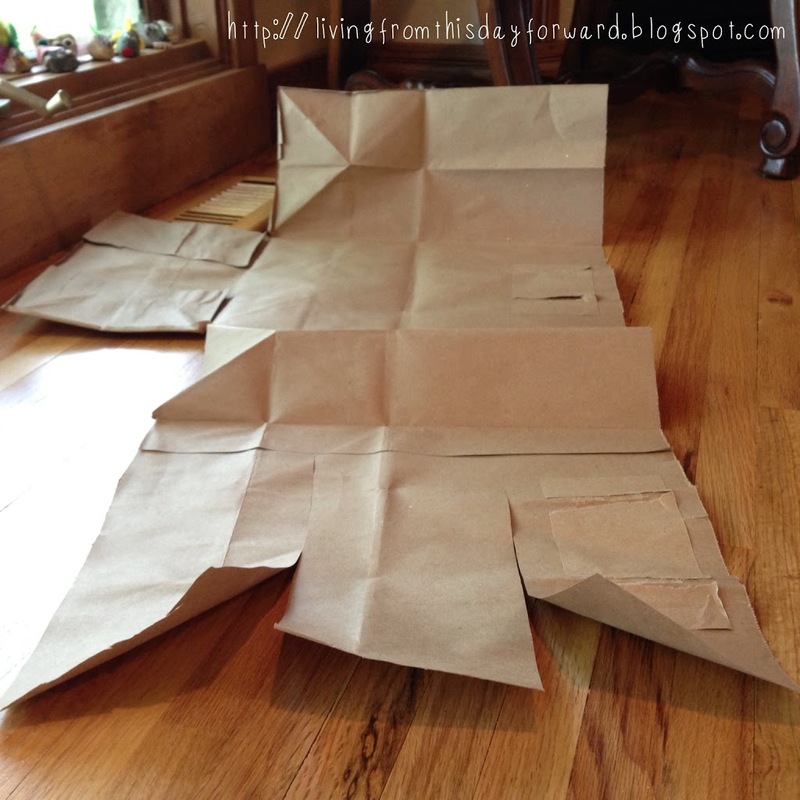 I cut the paper grocery bag down one side edge and along all bottom edges. This is seriously hard to describe so just refer to the picture below. 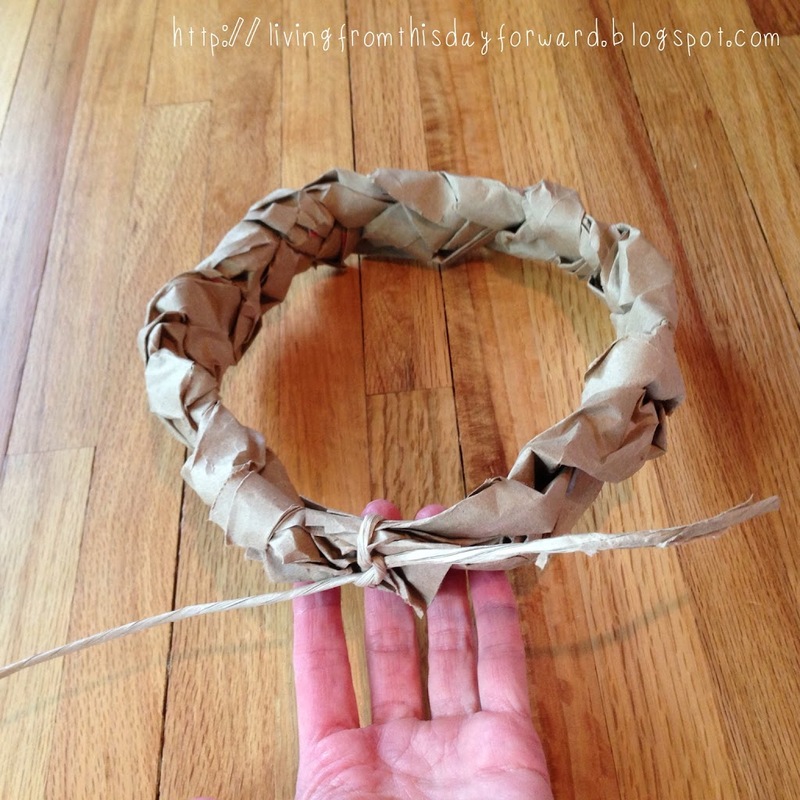 I wanted to use as much of the length of the paper bag as possible. The bags I had on hand were from the big red bullseye store and had the twisted cord style handles. 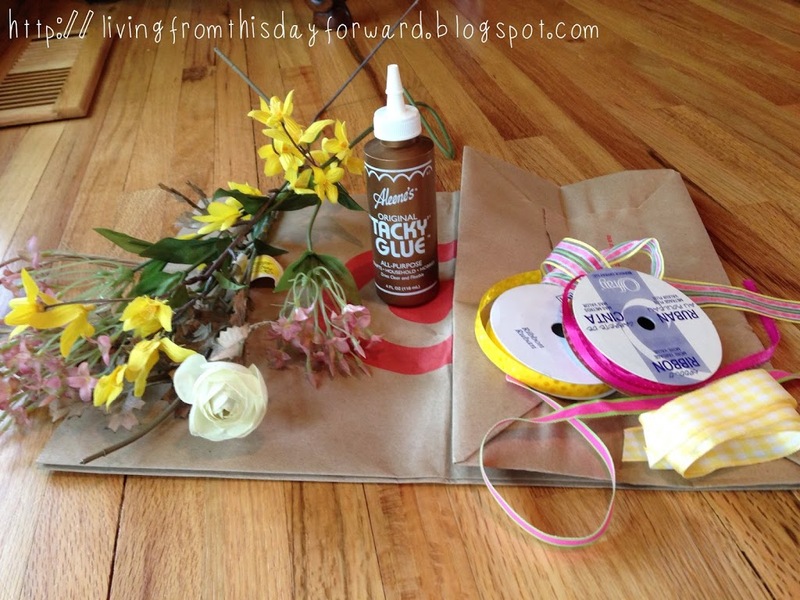 I pulled the handles off and saved them – they worked wonderfully for an upcoming step. 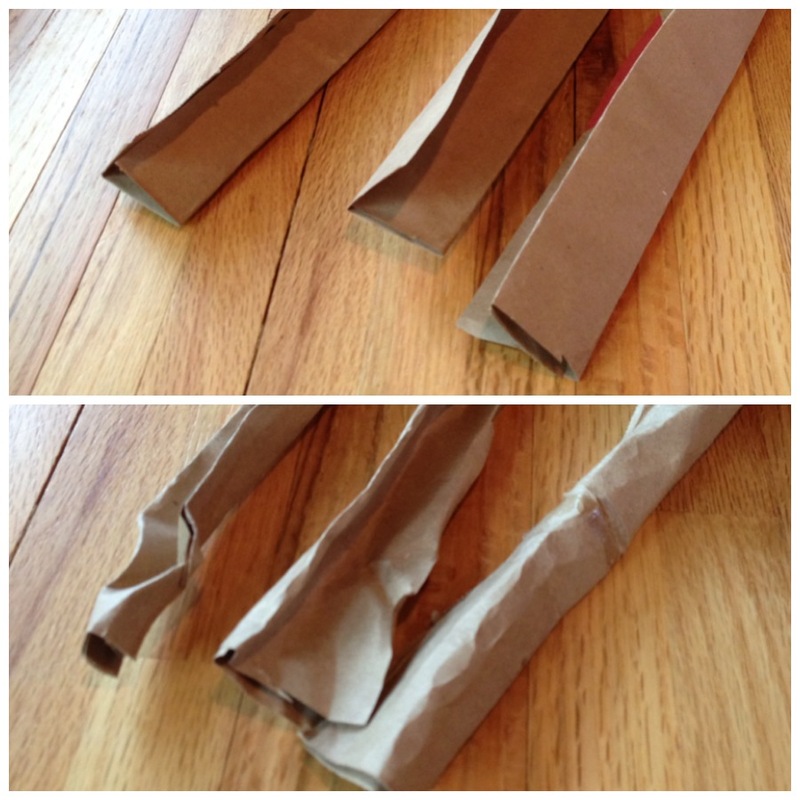 Cut the bag lengthwise into three equal strips. To hide the red print that was on the bag I folded each strip in twice. From here scrunch each strip tightly into a rope. Have someone hold the three scrunched ropes together on one end. I was fortunate to have the assistance of my lovely Little Lady. 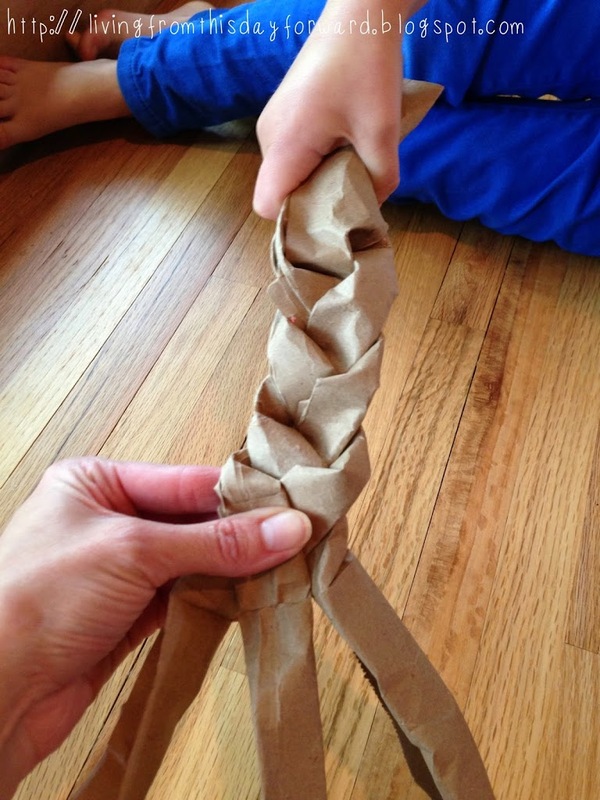 Braid the three ‘ropes’ together to the end. You may want to shape the braid – stretch it out a little and maybe scrunch to give it a consistent feel. Once you’ve braided the crown measure it on the prince/princesses head to size. I used the cord handle from the shopping bag to tie the two ends together at that point. Cut the excess, if any. 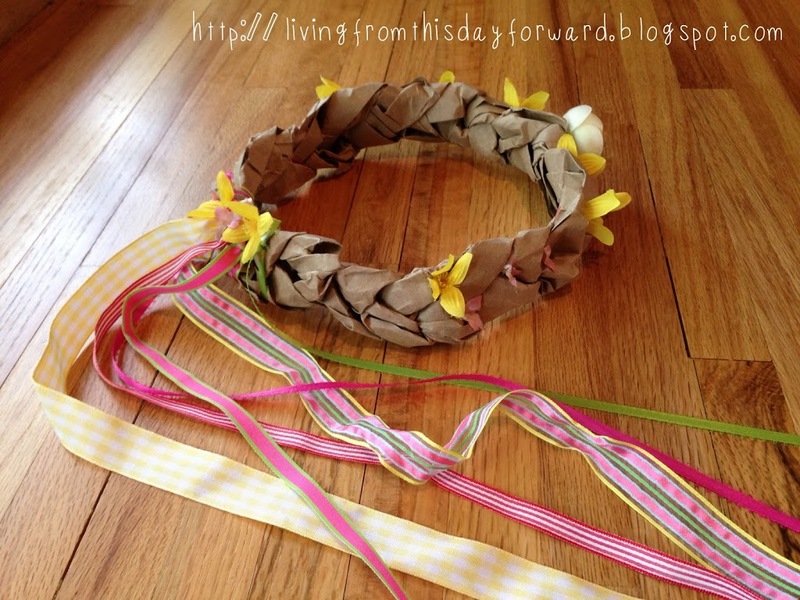 We adorned the crowns with silk flowers, gluing them all around in the crooks of the braid. 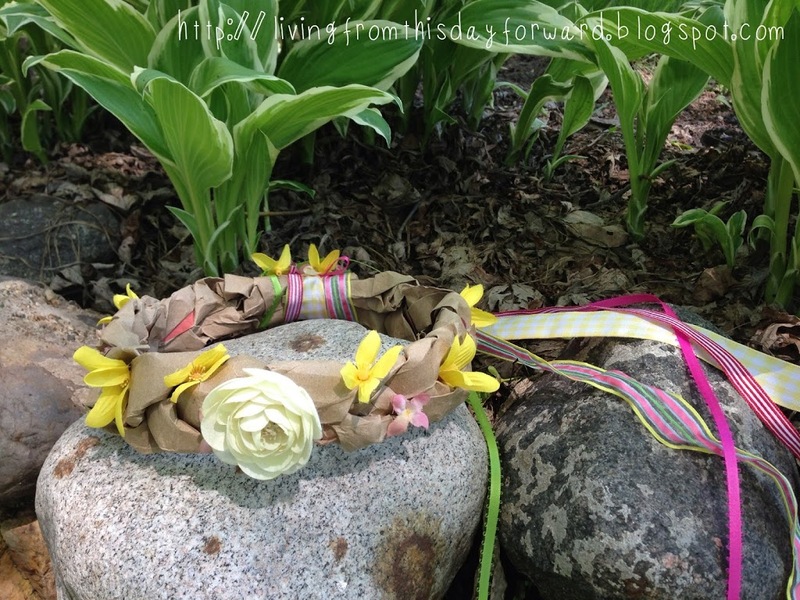 I tied an assortment of ribbons to the back of the crown to hang loosely amongst her golden locks. I wanted to include Little Man in the fun so we decorated his prince crown with leaves and foliage from the silk flowers. 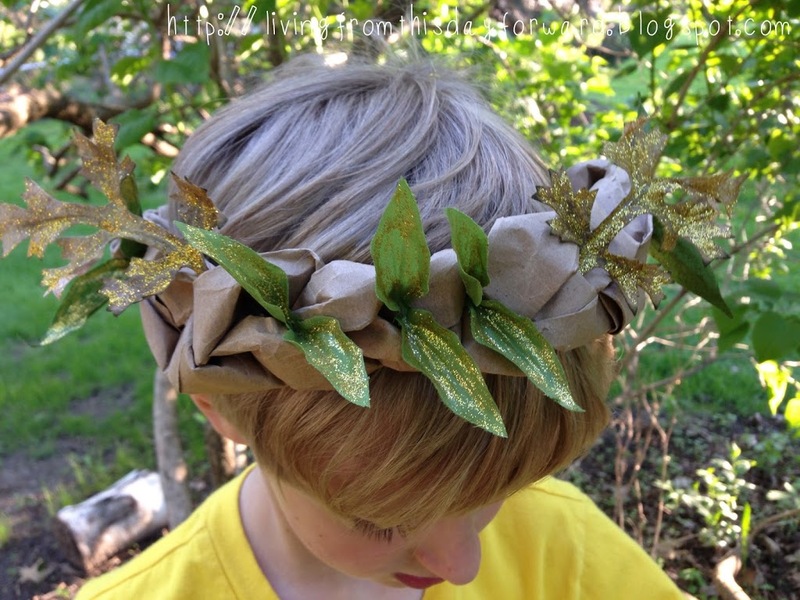 We gave it a Roman Civic Crown feel by painting the leaves with gold glitter glue. With his chest plate and sword he will defend the Woodland Princess from evil wrongdoers, if she doesn’t get to them first. 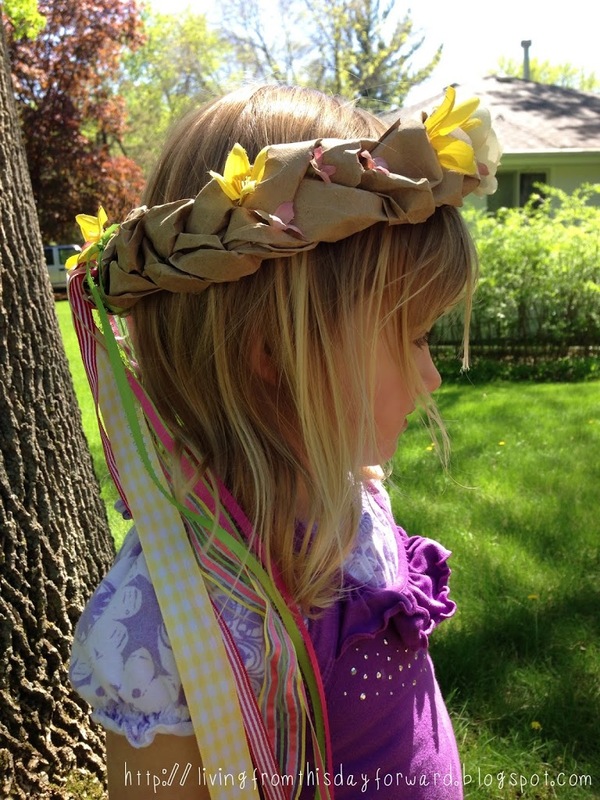 I think we need to make some for our grown-up selves…Woodland Queens!